Let’s build a city with a tower that reaches to the sky! Narrator: Every moment of every day, we have a choice of whether to serve God or serve ourselves. In today's story from the Old Testament, people thought that they no longer needed to obey God. Speaker 1: Everyone! Gather around! Speaker 2: We've got something important to say, and you all need to hear it. Crowd: (Muttering, asking each other) What is it? What's going on? Speaker 1: We have lived here on the plain in the land of Shinar for many years. Speaker 2: We've worked together to build this great city. Speaker 1: We've learned so much, and we can keep learning how to build bigger and better things. Speaker 2: (Inciting the crowd) Look and see how powerful we've become! Speaker 3: (Inciting the crowd) And we've done it all on our own – we haven't needed anyone's help. We haven't even needed God! Person 1: He's right. We can build anything we want to! Person 2: We've only started – think of how much we can do. Speaker 1: Listen, my friends. Heaven isn't far above the earth. Let's build a tower that reaches to the sky, and climb up to the top and be like God himself! Speaker 2: We'll use bricks instead of having to cut stone, so not only will it be strong, but it will grow quickly. Soon everyone will know what we've accomplished! Speaker 3: We'll be famous; people will tell great stories about us! We won't be scattered all over the world. We can stay right here and do whatever we want! All: Let's all get to work! Come on, let's go! We can do it together – we don't need God! Narrator:The people were building the tower as a way to glorify themselves. They had made their choice: They didn't want to glorify God. But God saw their hearts, and He would not allow them to keep sinning and mocking Him. God wanted them to obey him and to fill the earth. God:These people are working together because they all speak the same language. This is just the beginning. Soon they will be able to do anything they want. Come on! Let's go down and confuse them by making them speak different languages—then they won't be able to understand each other. Speaker 1: Hey, can you go get some more bricks for me? Speaker 2: (Different language) I don't know what you want! Speaker 3: (Third language) What did you say? Person 1: (Fourth language) What happened? Why can't you understand me? Speaker 1: I'm taking my family and we're leaving. You people are crazy! Narrator: They had to quit building their tall tower, because they couldn't even talk to each other. 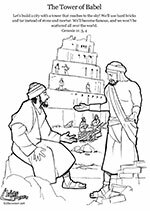 That's how it came to be called Babel, which means “confused” – because God confused their languages, then scattered them all over the earth. If you would like to read more stories about God's people and God's promises, check out the book of Genesis. It's the first book in your Bible.